The electrical engineer, Jonatas Guimarães, and his wife, Raquel Brito, who is a Production Engineer, joined the Connected course at the Eldorado, Minas Gerais Office and to celebrate the end of the course they went to Europe and put their fluency to test. Jonatas and Raquel had different past experiences with the language. 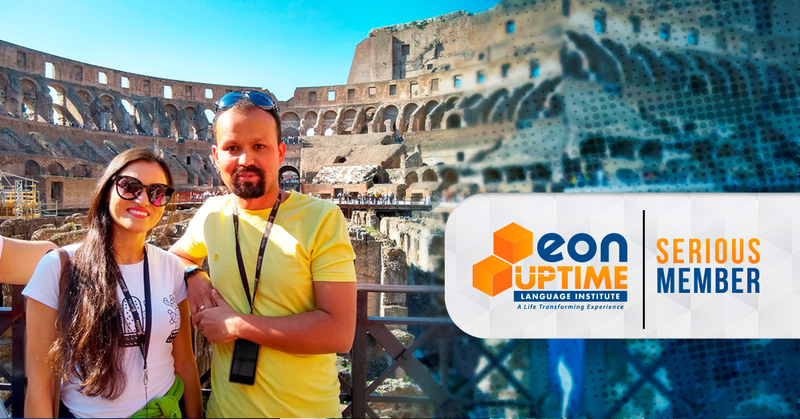 While she didn’t study in different language institutes, he tried a bunch of different methods until they came to EON UPTIME. “When I was younger I tried many different schools that use traditional teaching methods. Those places made me believe that I needed years and years to be able to speak English. It seems like they want to keep you there for as long as they can. It was only after I came to EON UPTIME that I saw it was not like that at all,” Says Guimaraes. The fact they did the entire course together, also helped. Raquel said that they practice together and one motivates the other. After such a good experience in the classroom, it was time for them to test it out in real life. The couple traveled to Italy and France, two countries where English is not the first language but in Touristic areas, it is always very useful. “Speaking English was very important for us, especially during the tours because they are all in two Languages, the local one and English. And we planned the trip all by ourselves.” Says Raquel. Now that they are back to their routine, they can see that English is helping them professionally as well, whether it is during a conversation, a conference or reading technical documents. The language changed their lives is so many ways.